Hiya guys! I have a very tongue-in cheek post to share with you today that I'm hoping you'll love. Usually I don't curse on my blog or online, but in actuality I have the worst sailor mouth. Today's post will contain some cursing and all around saltiness, so I guess fair warning. 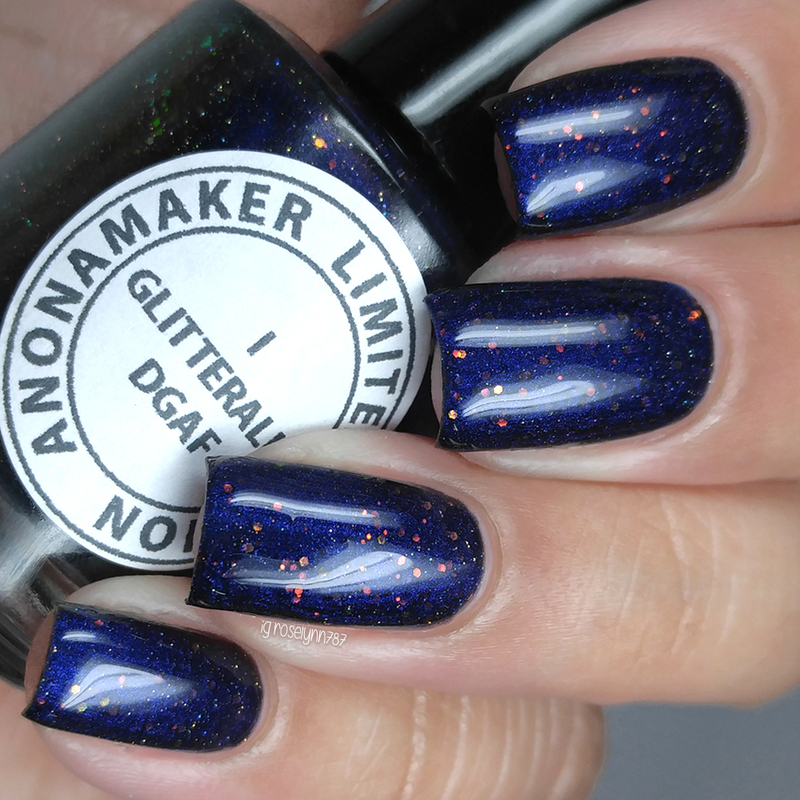 Today I'll be sharing the bi-monthly Anonamaker Box, spawn of the colorful bunch over at Acetone Alley. This is a pretty large Facebook group that pretty much is our nail corner unfiltered. Even though I am the most lurkiest lurker in existence, I do enjoy this group so much! Whether it's anonymous or not, shady behavior and people will be exposed... and I will be happily reading along as I munch on some popcorn. But getting back to the box, this is the inaugural release of the Anonamaker collaboration! This will be a bi-monthly release that combines some super sassy polishes and other items made by six indie brands. 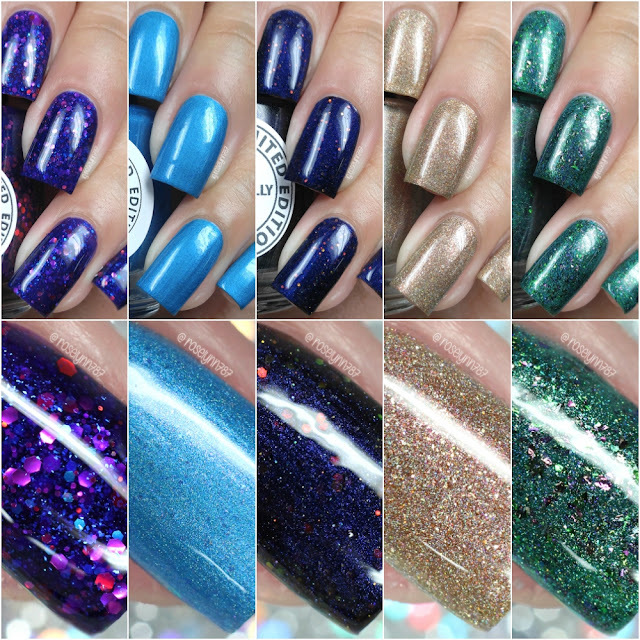 This month features the following creators: Girly Bits Cosmetics, Tonic Nail Polish, Delush Polish, Bohemian Polish, Heather's Hues, and ellagee. But do you want to know the catch? You won't know which maker created which shade until you receive the box! Is that not the cutest idea?! The Anonamaker Box pre-order will be available from October 15th through the 25th on anonamaker.com. Each box retails for $50 plus shipping. You will also have the option to buy any individual shade for $13. The first 30 boxes ordered will ship right away, while the rest of the boxes and all individual item orders begin shipping on November 9th. #gimmefreeshit can be described as a bright ocean blue holographic polish with dark purple flakes and a purple/pink shimmer blended in. Definitely one of my favorites in this polish, but if you know me then you know I'm always a blue fan. The formula has a really nice smooth and opaque application. Minimal visible brush strokes blend to the finish after topcoat. I did experience some minimal staining on removal, but it was nothing a good scrubbing couldn't get rid of. It dries to a semi-matte finish on its own. Shown here in two coats and sealed with a glossy topcoat. 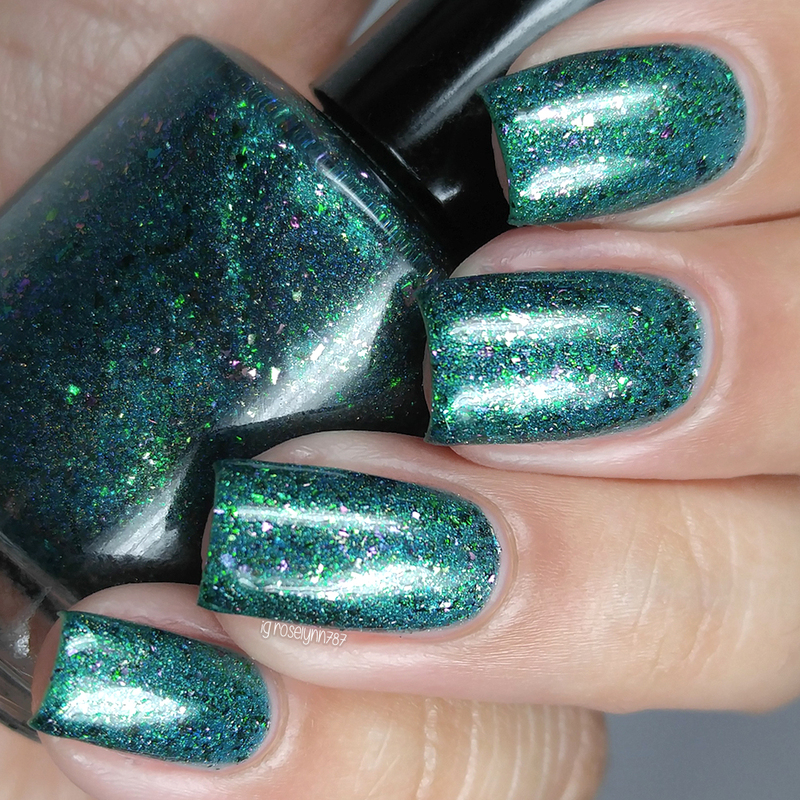 Asshat Delivery Service can be described as an emerald green holo with bright green shimmer and tons of shifty multichrome flakes. Named after the constant influx of anon complaints. This beauty really comes to life under direct sunlight. Sigh. 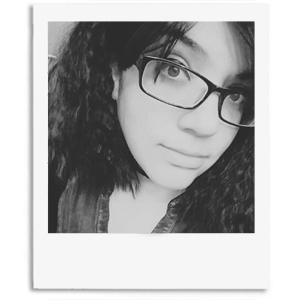 I wish I could take photos during the day and not be a damn vampire all the time, haha. The formula has a really nice build-up and flakie distribution. Even though it's a sheer consistency, the jam-packed nature of the base helps achieve full coverage with ease. Shown here in three coats and sealed with a glossy topcoat. 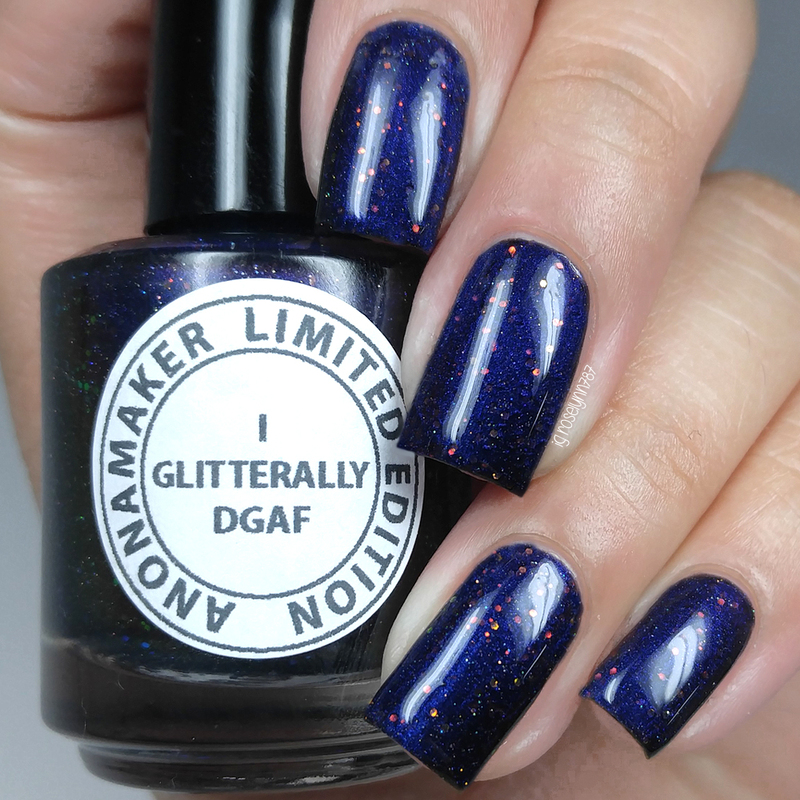 I Glitterally DGAF can be described as a dark navy blue/purple/maroon shifting multichrome with tiniest holo micro glitters and iridescent red/gold/green shifting glitters. I adore the color of the glitters against the base, it adds so much more depth to the finish. Again another maker with an amazing formula and consistency. This one dries to a slightly textured finish due to the glitters, but double topcoat helps smooth down the finish. Shown here in two coats and sealed with a glossy topcoat. Sandy Bits can be described as a golden bronze loaded with highly reflective microflakes as well as several types of holographic particles, and hints of a light pink flash at certain angles. I wasn't expecting to like this shade against my skin complexion, but I actually think it suits it perfectly. Great formula with easy build-up for full coverage. Again with this one there is a slightly gritty finish, but one thick layer of topcoat smooths it out. Shown here in two coats and sealed with a glossy topcoat. 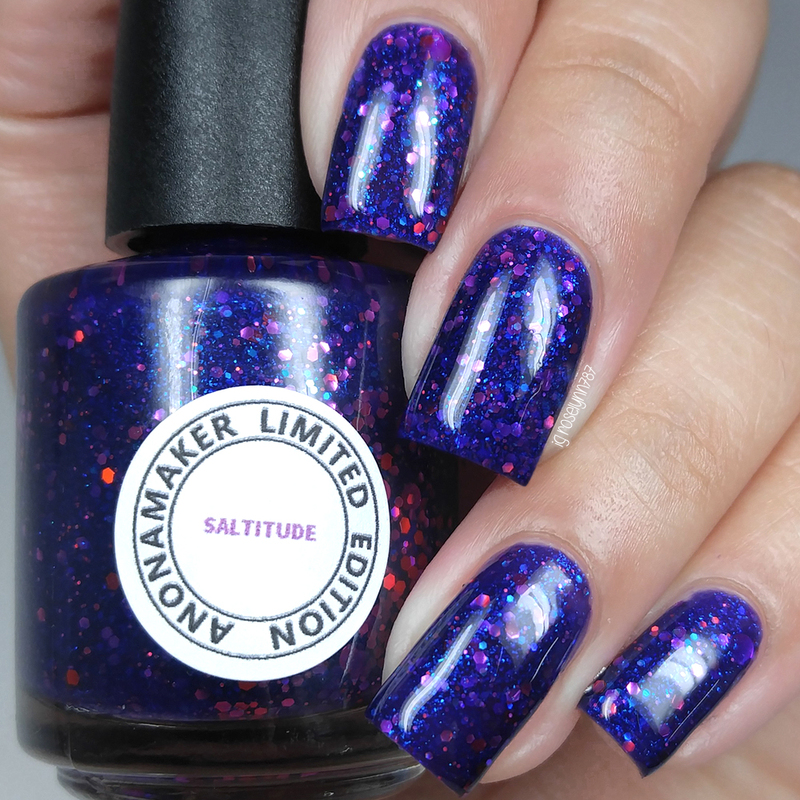 Saltitude can be described as a rich fuchsia purple jelly, accented with flashes of blue sparkles and encrusted with fuchsia, pink glitters. Isn't this a freaking stunner?! Holy balls I never want to take this off! You know what's even better than it looks? The formula! Considering this is a jelly I was stunned at how opaque the formula was and the glitter distribution is amazing as well. There was no need to fish for any glitters as each brush stroke was jam-packed with them. Shown here in two coats and sealed with a glossy topcoat. Along with the polish there are a few extra goodies to enjoy as well. 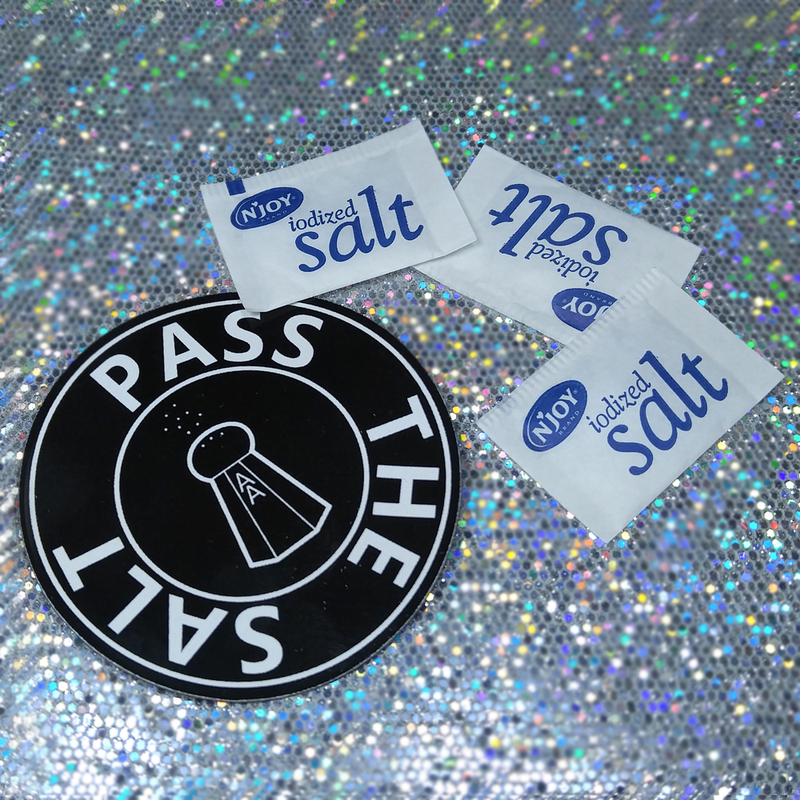 One of which includes this 'Pass the Salt' magnet! You guys know I put this one front and center on my helmer, haha. T'waffles and Syrup... By far the name that had me holding my sides from laughing. Just the word 'twa'ffles' alone is now a standard word in our household, especially around my husband. Now the balm comes in a 15mL container and come scented in a blend of sweet waffles with a hint of vanilla and maple syrup. 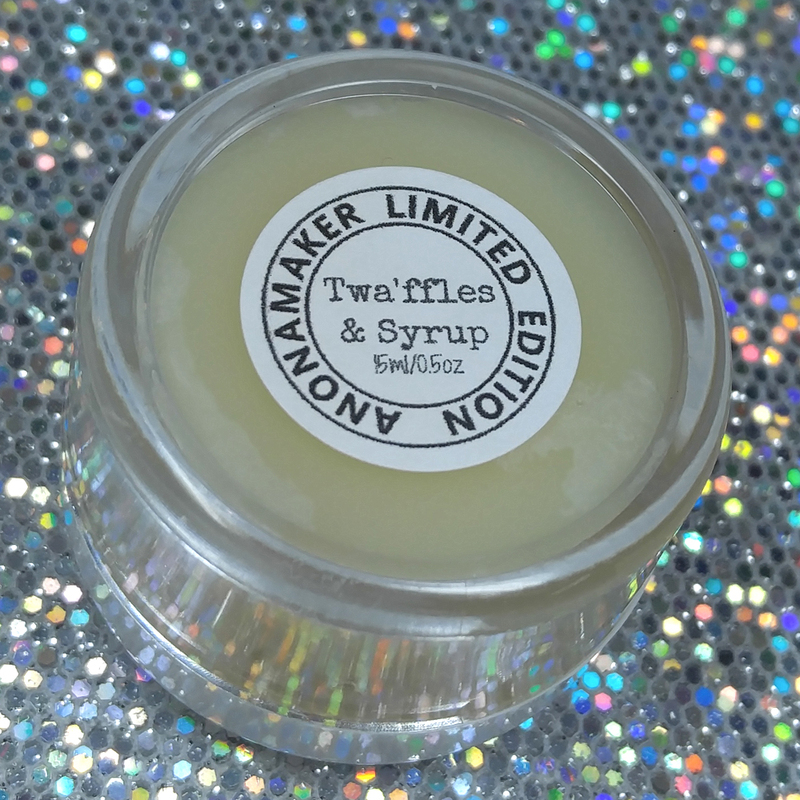 Personally I really enjoyed the formula of this balm as it's not super oiled down. The smell is also very potent, which helps mask the acetone smell I usually have on my nails after a mani session. Although this comes with the box, you'll also have the option of purchasing the balm by itself for $6.75. Overall I love every single one of these gorgeous shades and just the whole concept of this box. Let's face it guys, we all have some saltiness in us sometimes and that's okay. It's what makes us actual human beings and not phony barbie drones. And honestly the best part about this box is the non-pressure to have to get the whole box! Even though we all love our polish, not all of us can afford to dish out money towards it. As someone who lives pay-check to pay-check, it's such a relief to know I have the option to just get my favorite if I couldn't afford them all. To recap, the Anonamaker Box pre-order will be available from October 15th through the 25th on anonamaker.com. Each box retails for $50 plus shipping. You will also have the option to buy any individual shade for $13. The first 30 boxes ordered will ship right away, while the rest of the boxes and all individual item orders begin shipping on November 9th. Be sure to follow the Anonamaker Collboration on social media and don't miss out on what's sure to be a lot of salt-filled boxes to come! I love the one I *think* is from girly bits! I love the concept of not knowing which maker made which polish. That's great! Asshat Delivery Service has my heart! This was such a fun box. Your swatches look amazing as always! Interesting concept!! I like that you can buy the shades individually.